The 3 Es Of Efficient Team building | Business Article | MBA Skool-Study.Learn.Share. A major challenge for the organizations is to develop teams to optimize the synergy and eradicate the possibilities of conflicts. While most of them realize, efficient communication is the key to achieve esprit de corps, they do not realize that the success mantra does not just lie in what is communicated but how it is communicated and that encompasses a set of factors, based on the pillars: Energy, Engagement and Exploration. This has practically transformed the team building exercise from art to science with a set of protocols that we will discuss in the course of the discussion. 1) The talent and knowledge level of the team members is secondary to the performance of the team, what matters most is gauging their communication patterns and training them to hone them in the right direction. 2) The members communicate not just with the team leader but equally with the entire team. 3) The overall gestures of the team members are energetic and focus on addressing each of them in the conversation. 4) Each member is given a chance to express his viewpoint, wherein every one listens to every other and also ensures that he speaks precisely and to the point. 5) The team members are not just restricted to the team ideas but explore new channels to grab new ideas and enrich the team as a whole. This factor keeps varying depending on the situation under consideration. Elated events would normally boost the overall energy levels while the challenges may sometimes lower the energy levels. This is the overall distribution of energy in the team. Lets us consider a team comprising of 3 members X, Y and Z. So the engagement can be calculated as the average of energy between X and Y, Y and Z and X and Z. 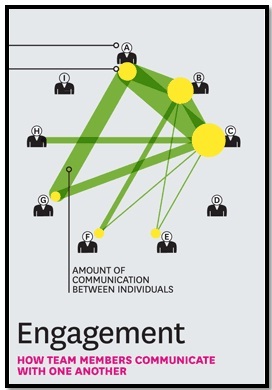 Thus, a strong engagement would be achieved when there is a high level interaction between every member. It is interesting to note that the success of the team is not just restricted to the internal communication levels but also to the external ones. This is the channelizing of the energy to other teams, to gain insights enriching the overall team performance. This becomes particularly significant to teams involved in innovative tasks, as it helps to gain fresh insights. The team members need to interact with their back and side channels to explore new perspectives. The conservation of energy principle states that “energy can neither be created nor destroyed, it can only be transformed from one form to another”. So with finite energy, the engagement and exploration lie at a tradeoff situation, wherein more focus on one leads to sacrificial effect on the other. So, if energy is concentrated inside the team, the energy allocation for exploration is reduced. This criterion has the members as its reference and the overall understanding is based on this reference. The advantage of this method is that it helps to identify the engagement and exploration on one-to-one basis, making the assessment of the team members easier and also targeting the dominant and unengaged team members, necessary for the optimization of the performance of the team. The diagram below shows the energy distribution of the team. It is evident that A,B, and C have most ofthe energy contribution in the team due to which the overall distribution is skewed towards the right, instead of being in the centre. This normally generates the “team within the team” and other members simply feel being ignored. Thus, the management can take corrective measures to improve the energy contribution from the other employees. 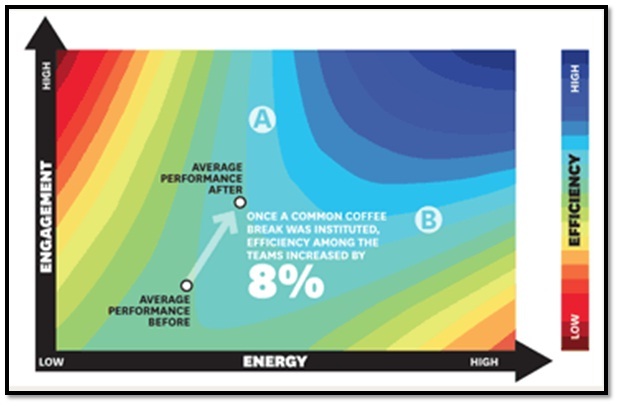 The skewed energy distribution also impacts the engagement of the team. The most lethal effect is from the “localized team formation” within the team who take the position of the decision makers, with little or no output from the other members. The high energy members form a closed-network, with minimum contribution from the other members. The team simply wastes its other resources whose input is not included. 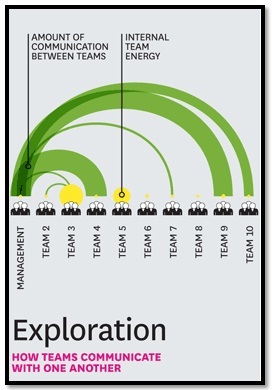 Exploration can be a tricky parameter to gauge as there is always a trade-off between engagement and exploration and the decision of prioritizing is left to the team members. 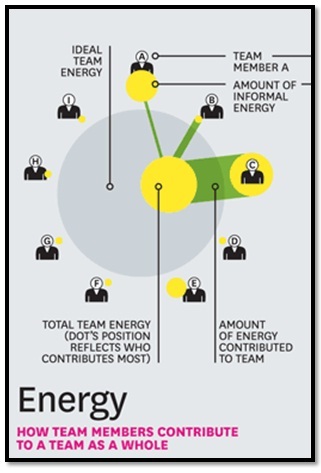 From the figure, we see that teams with high internal high energy would not perform well on the exploration front as the team members would be channelizing their energy into the internal engagement, than engaging with the other teams. Thus, explains their high exploration and miniscule internal energy. The model is helpful with geographically diversified teams as it ensures equitable distribution of energy, better engagements and exploration. This method helps to understand the patterns of interaction i.e the face-to-face communication over the other methods like texts and e-mails. Based on this study, the various issues can be addressed to promote an improved communication in the team and with the outside teams. 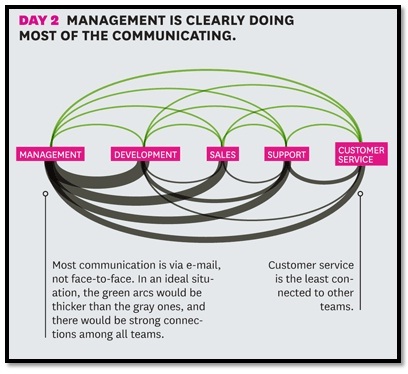 These issues comprise of finding out whether the crucial departments are well connected to the other teams , is the communication between different departments even or how does the communication pattern change with the changes in the activities of the organization. Let us take a look at the pattern during a new product launch. In the initial few days, the management looks after most of the communication and that is primarily through the emails. The teams do not have much interaction with the other teams . 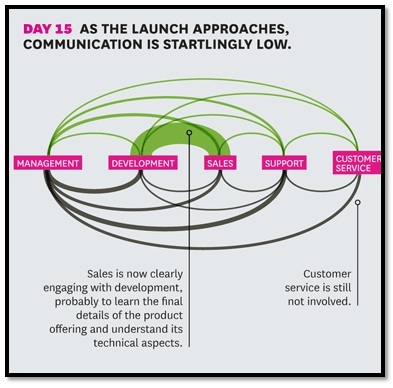 As the teams begin to work on their assigned tasks, the face-to-face communication develops between the sales and support teams as they have to work in collaboration for the launch. However, the other teams still do not begin to have any face-to face communication, while the management interacts with others through the e-mails. But the customer service team is unengaged into the interaction. Eventually, the interaction between the sales team and the development team catches up. And it is also evident that as the deadlines for the product launch approach, the e-mail communication of the management is reduced while teams begin to explore the other teams through face-to-face communication. 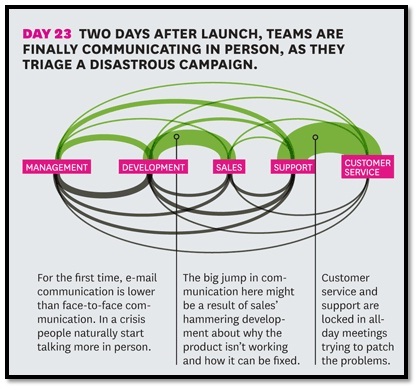 After the product launch, the pattern of communication is totally opposite to that of the pre-product launch scenario. The face-to-face communication between the different teams supersedes that of the e-mail communication. Another important observation is that now the customer service is in constant communication with the support team on matters related to the fixing of the issues that arise from the customer’s end. 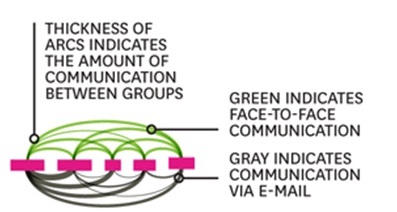 These observations can help the organizations to understand the communication patterns between the different teams and take measures to promote communication between them, thereby streamlining the overall performance. 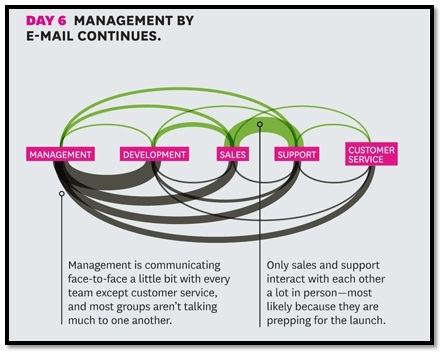 This model is helpful for the organization entering into new ventures, by understanding the different communication patterns that would evolve over the time frames. By understanding the level of face-to-face communication over e-mail communication, we can take corrective measures when issues of dysfunctional communication flow arise. 1) The most efficient teams were the ones that had high energy-high engagement. 2) However, the unbalanced states like low energy-high engagement or high energy-low engagement were detrimental to the team’s efficiency. On the contrary, low energy-low engagement teams outperformed than these unbalanced teams. From the figure, point A and B have same efficiency, though they have different combinations of energy and engagement. Thus, it can be concluded that maintaining a balance of energy-engagement was imperative for the efficiency of the team. Team building is a scientific process based on how to communicate and not what to communicate. No matter what is the nature of the industry, the signature characteristics that determine their success is energy, engagement and exploration. The visualization pattern can is useful tool to understand the communication patterns and identify the bottlenecks hindering overall team efficiency. The discussion thus boils down to focusing on the members with the right attitude and not just sufficient knowledge. Having considered this viewpoint, we can synergize the output of the teams, whether physically connected or parted. This article has been authored by Ela Koshal from WE School.